Sports Labs- What is the Big Fuss About Hybrid Turf Systems? What is a hybrid turf system? Hybrid systems were spawned from early iterations of soil-strengthened systems where soils were ameliorated with fibers or plastic mesh. These modifications enhanced or reinforced the soil structure to improve the root anchoring and retention, thus allowing some extended play to be sustained on natural grass surfaces that were suitably treated. 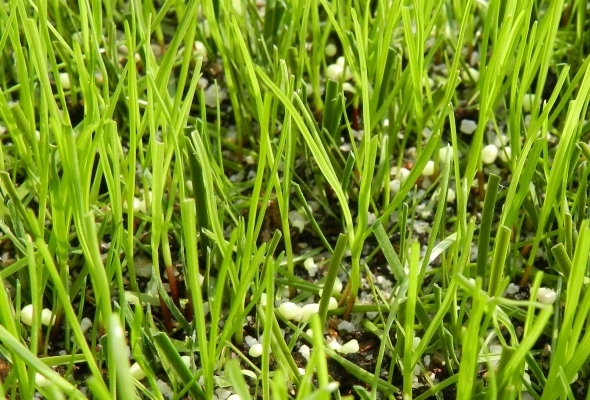 The modern hybrid turf system is a combination of synthetic fibers mixed with natural turf. The first iteration of this was the Desso Grassmaster injected fiber system which has been around since 1989, making it the very first to enter the market. A mesh or backing which contained fibers anchored to it was available in the early 1990's, however it was not popular and so it was not until 2003 that we see textile-based systems competing with the injected system that Desso produced. Around 15 years ago a Dutch manufacturer produced a woven product which was denser and much like a lightweight artificial turf; here an open mesh backing allowed grassroots to deeply penetrate through the backing and provide a sound anchor to the root zone. There are now many products on the market based on this same basic design. Things have evolved a great deal from the modified soil structures of the past. Now we have sophisticated machines that inject synthetic fibers into the soil, textile turf systems which have biodegradable backings and even shock absorption layers incorporated within the root zone. What are the benefits of using a hybrid system instead of developing good quality stadium turf or using artificial grass? Aesthetics – Even when the natural grass is worn, the pitch will still have a good visual appearance to both spectators and to TV cameras due to the green synthetic fibers showing through the surface. Some versions of the turf have up to 15% synthetic fibers in the construction. Even injected systems will have around 5%, so there is sufficient coverage to appear green even when badly worn. Cost – Textile-based systems are much more cost-effective to install and maintain than other turf reinforcement systems, sometimes by as much as half the price. This depends on the design of the pitch. Hybrid-based systems allow higher pitch usage. It may be possible to reduce the size and number of pitches at training facilities, thereby reducing on-going maintenance costs. On-going Costs – Once installed, a textile-based system costs no more than a standard grass pitch to maintain. By comparison, some other turf reinforcement systems will need more intensive maintenance and fertilizer regimes, and these can increase the on-going materials and labor costs. Equipment Costs – There is no requirement for specialist maintenance equipment with hybrid systems. Revenue Generation – The resilience of hybrid systems allows the pitch to be used for some additional events on nonmatch days, including corporate football days, concerts and public meetings -- all generating additional revenue for the club. How much does it cost to install? How does this compare to the cost of developing a good quality natural turf? This is a difficult one to answer because it does depend on the design of the pitch. There are a number of variables possible, so factoring these into the cost plan is important to make sense of overall costs. Textile-based systems have been laid on a fairly rudimentary root zone then grown in over it. This can be quite cost-effective but may throw up maintenance challenges down the line. Injected systems work best on a properly constructed root zone up to 20cm thick. For this reason, they are traditionally more expensive than textile-based systems. How do we know that it provides the benefits that are claimed? Experience – With Grassmaster and Xtragrass and the number of years hese products have been on the market, there is a wealth of experience out there. This is underscored by the large number of clubs that have recently invested in hybrid systems for their stadiums. User feedback is scarce, but we do know that sand-based pitches are firm to play on. Grounds maintenance staff do appear to be positive about the use of hybrid turf in what have become known as multi-use venues. Durability – The ability to use the surface more and effectively repair the surface has made the hybrid more acceptable to the natural turf community. At this time, the growth market is focused on stadiums. The initial cost to invest in a pitch and ongoing maintenance costs and labor mean that we will not see many community pitches using hybrid turf at this time. But, as the systems develop, we may see more filtering into lower leagues and high-use pitches used by community clubs. How can we assess performance? Comparisons – At Sports Labs, we conduct ongoing research that focuses specifically on the comparison of turf systems. This process involves testing natural, hybrid and artificial turf surfaces. The study has already taken in hundreds of fields and with samples spread across Europe. In this way, we are able to encapsulate the variety of surfaces, environmental conditions and maintenance practices which are used across the market. Player Perception Study – In association with the Scottish FA and the Scottish PFA, we are conducting a major player perception study to collect data on how players feel about the surfaces they are using in the professional league. This study is throwing up many interesting metrics which will be published widely in the summer of 2018. Correlation – Our objective is to correlate player perception with performance data for the surfaces played on -- and thus help manufacturers fine-tune their products to be more aligned with what players want from a surface. Comment - Hybrid surfaces are here to stay and as technology develops so surely surfaces will improve, too. We are certain that Sports Labs will be involved in this evolving and developing market and continue to help shape future product developments.